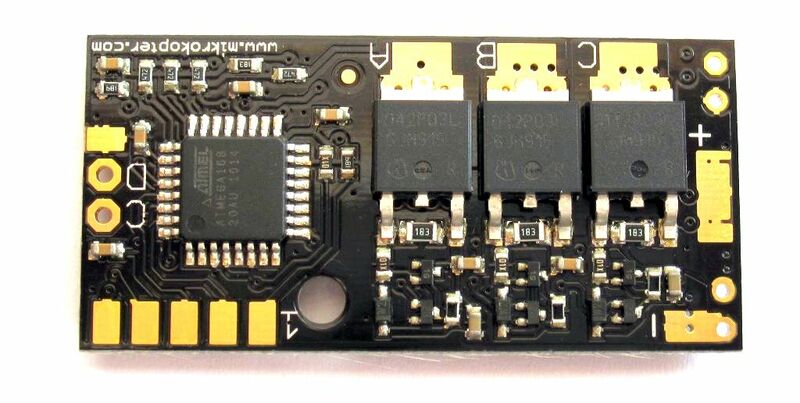 This it is a SMD-preassembled BL-Ctrl-kit, only the capacitors have to be self-assebled. Note: The BL-Ctrl 2.0 controller is specifically designed and optimized for our MK3638 motor. For maximum stability of the MikroKopter setpoints are set almost instantaneously on the motor. If other motors (especially larger power classes) are used with this controller, this fast change of setpoints can easily lead to very high peak currents, which bring the BL-Ctrl control to the limit or an overload. This is no fault of BL-Ctrl2.0 controller, but a systemic property. Please consider carefully whether a different motor is suitable.